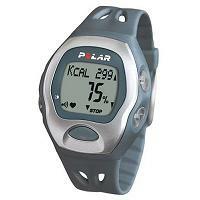 Polar A5 heart rate monitor is an intermediate heart rate monitor designed for general use and fitness training. The Polar A5 is a heart rate monitor which builds on the Polar A3. For comparison purposes I have bolded the features that the A5 has in addition to those of the A3. The A5 now shows you how many calories you have burnt, allowing you to set a calorific goal for your training session. Note that the BMI can't tell the difference between muscular and fat tissues. If you have a high BMI, don't necessarily interpret that you are fat, as the bulk of your mass may well be due to muscles! You can also do a Self Walk Test to measure your cardiorespiratory fitness. The result of the test is known as a WalkIndex. When you start the test, you are asked to do a walk for 1.24 miles. Polar A5 monitors your heart rate while you are walking. At the end of it, you get a number, the WalkIndex, which tells you how fit you are. It is really simple. The WalkIndex is comparable, in interpretation, to the VO2 Max. The A5 is also equipped with a backlight for when you are training in relative darkness. The Polar A5 heart rate monitor gives you high end features like measuring your BMI and WalkIndex (VO2 Max). These numbers are useful indicators of your overall shape and fitness. These plus the calories burnt feature means that the Polar A5 heart rate monitor will meet the needs of many users training for fitness and weight management. Note: Polar has also discontinued the A5 model i.e. Polar no longer makes it, though it may still be available in some internet shops. If you are looking to buy the A5, you may want to have a look the current models Polar F4, Polar F6 and Polar F11.